30,000 Canadians are hospitalized each year because of sepsis. More than 30% of these patients will die.2 Does that number alarm you? It should. It’s one of our country’s highest in-hospital mortality rates. Sepsis can be caught early, treated effectively and prevented from turning severe. The severity and poor outcomes that can result from not doing so are unacceptable. Learn about our work to improve care for sepsis. 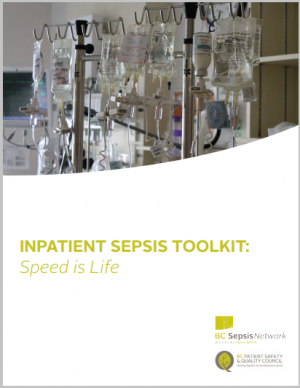 This Toolkit aims to provide BC inpatient hospital wards with information, resources, and tools to successfully initiate, implement, and spread best practices for sepsis in child and adult populations across BC. 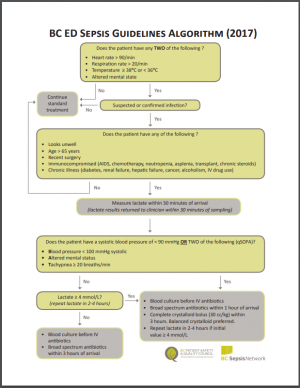 The provincial Sepsis Clinical Expert Group developed the BC Emergency Department Sepsis Guidelines, taking into account the most up-to-date literature (references below) and expert opinion. After completing this free online module you will be able to describe the pathophysiology of sepsis, identify the signs and symptoms of sepsis, and list the steps to treat sepsis effectively to prevent progression to severe sepsis or septic shock. Click the photo on the right to begin. Note: Health Care Employees in BC wanting a record of completion for this course should access the module through the CCRS. The BC Sepsis Network is proud to introduce Read by QxMD as a knowledge translation partner in promoting the most up-to-date and best practice guidelines for treating sepsis. Play Tetris To Treat Sepsis! 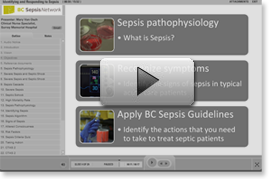 Click here to try Septris, an innovative web-based game developed by researchers at Stanford University Medical Center to train physicians to make quick treatment decisions for sepsis patients. This document provides a framework for reducing sepsis morbidity and mortality in emergency departments. This set of four eye-catching posters are ideal for displaying in emergency departments. This popular lanyard attachment helps point-of-care staff identify sepsis early! Sepsis leaders within the network are implementing the new BC Sepsis Guidelines in our hospitals,. Prompt recognition and timely management of patients with sepsis in hospital is critical. Do you provide care in an Emergency Department? World Sepsis Day 2017 was September 13. Download resources used to spread awareness of the initiative. From October 13, 2013 to March 11, 2014 the BC Sepsis Network saved 150 Lives in 150 Days. E2E is an academic organization established to improve clinical and operational outcomes for ED across BC. Kissoon N, Carcillo JA, Espinosa V, et al. : World federation of pediatric intensive care and critical care societies: Global sepsis initiative. Pediatr Crit Care Med. 2011; 12:494-503. Canadian Institute for Health Information. In focus: A national look at sepsis. Ottawa 2009.